Are you ready for choir rehearsal this week? The music is neatly sorted into everyone's folders, you have your rehearsal plan ready to go, and you have a stack of brightly-colored reminders on the piano to send home to parents. What's missing? It's easy to overlook, but that short period before rehearsal when children sometimes show up early (sometimes really early) calls for a little extra preparation. What can you plan that will keep any number of children engaged for 10-15 minutes? Some people use worksheets, but I like playing some kind of game that gets everyone involved (from the moment they walk in the door) and promotes listening skills, keeping a steady beat, movement, music-reading skills, and creativity. Most of the ideas in this post take little to no preparation or facilitation on your part - just lay out the materials in advance and maybe turn on some music to get them started. 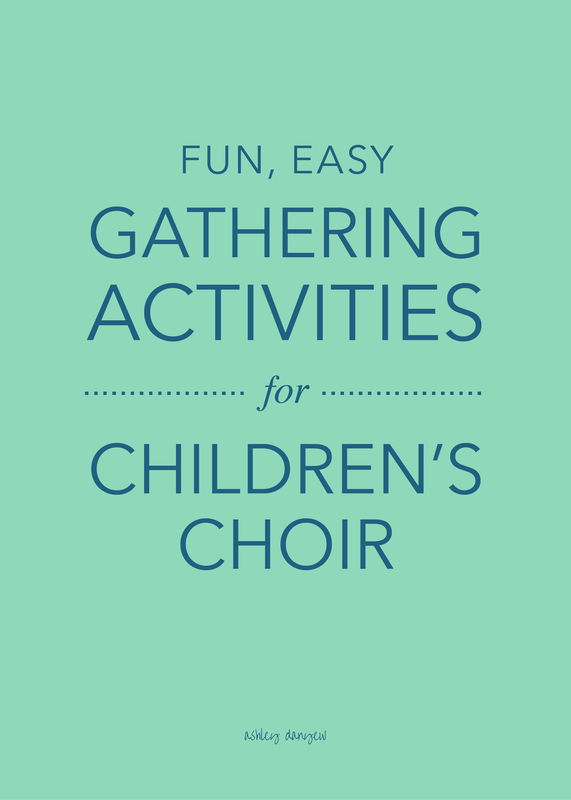 This way, you can do any last-minute to-dos before rehearsal starts while the early-arrivers play a fun, musical game. There are so many things you can do with a set (or three!) of rhythm cards. I made my own several years ago using Microsoft Word and a music-note font and recently updated them and added them to my shop so you can use them, too! The Rhythm Pattern Card Set (pictured below) includes 192 different patterns in duple (4 beats per card) and triple meter (3 beats per card) using quarter notes, half notes, quarter rests, eighth notes, sixteenth notes, dotted half notes, and whole notes. Children set up two rows of four cards, keep a steady beat, and count the patterns together. Mix it up by having them speak different rows at the same time (like a duet)! Added bonus: This will help prepare them to sing in two parts! Each child chooses four cards featuring similar patterns (e.g. quarter and eighth notes or quarter rest patterns), laying them out for others to see. Taking turns, children choose one pattern of their four to chant out loud (ideally with a neutral syllable such as "bah") while the others try to identify it. For an extra challenge, have children choose eight cards and chant two of their patterns back-to-back. Children work together to create a rhythmic series (minimum 8 cards, or two phrases). Keeping a steady beat, children chant the rhythm together. After each successful repetition, flip one card over to the blank side (I call this a "wild card"). Children can take turns creating their own patterns in these spots or improvise a pattern all at the same time. Just like the card game, Memory, children take turns flipping cards over to try to find a match. Use two identical sets of rhythm cards. Set up the game before children arrive by arranging the cards in rows, face down (make sure each card has a match!). Mix it up by playing with tonal cards (3-note patterns such as Do-Mi-Do or Do-Sol-Do)! The Orff Approach to music education was developed by Carl Orff during the early 20th century. Based on a child's natural approach to learning (through play), the Orff Approach offers children a natural way to explore, create, and discover music (source). Orff instruments such as miniature xylophones, marimbas, glockenspiels, and metallophones (all with removable bars) let children explore and experience music right away. If your church program has Orff instruments, the gathering time before rehearsal is a great time to use them. Set out the instruments (removing some of the bars, if you want to focus their music-making to particular sonorities or modes) and simple melodies and/or rhythms for the children to play. Encourage them to create their own arrangements, make up new patterns, and play together. Boomwhackers are color-coded plastic percussion tubes tuned to musical pitches - longer tubes are lower pitches, shorter tubes are higher pitches (source). Boomwhackers create sound when struck - tap two together or "whack" on the floor or other surface. You can also purchase a special rack to hold them and play them with mallets, like a xylophone. See more related products here. Boomwhackers work well by themselves or with Orff instruments. Put on some music and have children play along with a steady beat. Introduce the concepts of harmony and chords by having children play along with a simple hymn or folk song (something that uses I and V chords like "How Firm a Foundation" or "A Ram Sam Sam"). See more song suggestions here. Create a chart or write the notes of each chord on a whiteboard (e.g. C-E-G, G-B-D-F) and have children practice the chord changes together. Clapping games have been around for a while and have proven benefits for helping children's development (source). Plus, they're a fun, easy way to engage children right when they walk in the door. Most clapping games have a repeated sequence of motions: clap, clap partner's hands, clap right, clap left, tap, etc. Review the sequence slowly a few times, calling out the motions. Then, introduce the words (and melody, if sung). Here are 16 fun hand-clapping games to play with one child or a whole group. This is a great steady beat activity and it's very easy for children to join in as they arrive. Have everyone sit in a circle. Choose music that has a strong steady beat and pass a bean bag (or stress ball or tennis ball) around the circle with the beat. For an extra challenge, say "switch!" every so often to change the passing direction. This would also be a great activity to do with a piece that gradually speeds up (like Grieg's "In the Hall of the Mountain King" or Tchaikovsky's "Russian Dance" from The Nutcracker Suite). What are your favorite gathering activities?